Here’s another viral Bitcoin SCAM. This time it’s called the Bitcoin News Trader scam, and this verified get-rich-quick scheme is extremely deceptive and designed to trick and deceive innocent victims. Why do we believe it is getting viral? Simple, as you will see in our Bitcoin News Trader Review, there are multiple fake news advertisements, fake reviews, and various banner advertisements in social media such as Facebook and LinkedIn. But that’s just for starters. The main problem we have with the fake Bitcoin News Trader SCAM software and bogus signals app has to do with the fact that it is powered by fraudulent software and integrated with rogue offshore brokers with names like GFC Investment or Kaya FX. If you have signed up for this fake app then your phone number is about to be distributed to some very sleazy sales reps with a strange accent and a stingy salary. These crooks are a part of a boiler room scam type of Forex operation which targets opportunity seekers primarily from the United Kingdom, Singapore, Sweden, Norway, the Netherlands, Germany, and Switzerland. So, if you are from any of these countries, we recommend you continue reading our detailed Bitcoin News Trader Review to get a better grasp of what you are getting into before joining this dubious investment platform. 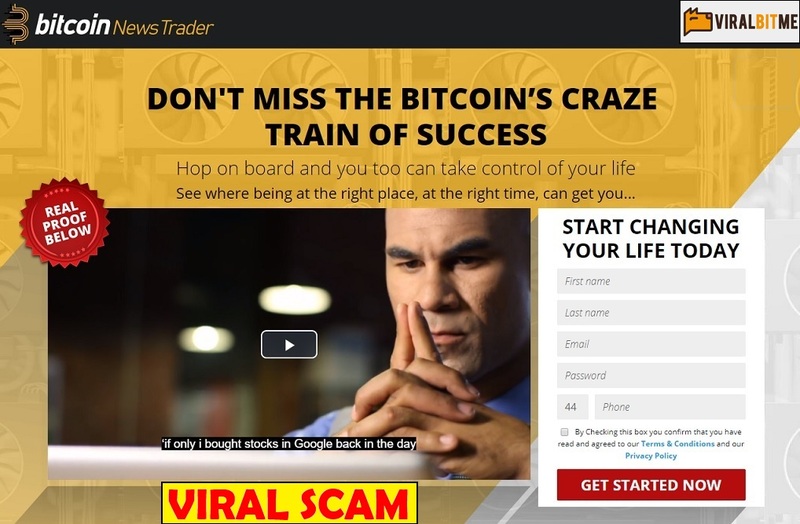 Here is the Bitcoin News Trader scam website and members area. A closer look will reveal a whole bunch of hype, and all of it is designed to get you signed up and depositing with a fake broker account. Here you will find the fake news article we were able to dig up. A closer look will reveal the links inside redirect viewers to the Bitcoin News Trader SCAM signal software. Again, the ripoff artists are exploiting the viral nature of Bitcoin and the fact that many people have actually become new millionaires trading this cryptocurrency. 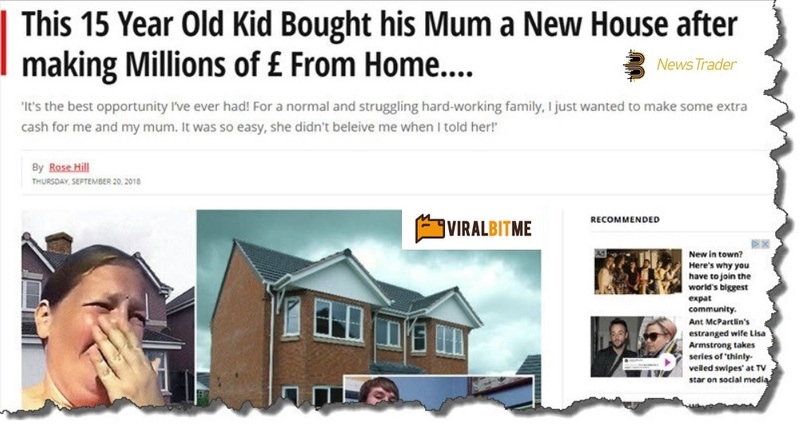 You can clearly see they write that a 15 Year Old Kid buys his mother a house after making millions of £ From home. Bitcoin News Trader Review: No, You Will Not Become a Millionaire Overnight! The Bitcoin News Trader SCAM software is being very heavily promoted by a number of affiliate networks and media agencies which specialize if cryptocurrency-related schemes. The sales video talks about a “success formula” and a kind of secret system which grants you access to “high-quality news before everyone else”. This means they software generates signals and based on those recommendations you will need to buy/sell contracts and trade currency pairs such as USD/BTC or EUR/ETH. They say you only need to work a couple of hours a day to generate a significant income (£ 3,457 Daily). But that is a ruse and we don’t believe these liars and their thieving software. Its just how the internet works. Assuming you are not a heavily financed operation with seed money or an investor with deep pockets you have to operate as an affiliate and start generating sales. The way its done is by recommending software, but therein lays the problem. Affiliate marketers do not necessarily care about the quality of their products, they mostly care if they sell well. So obviously they are selling you dreams with the hope that you buy into their little story and invest. But that is both unfair as well as unethical, so be careful. The Bitcoin News Trader SCAM is a nasty, viral, and dangerous scam designed to steal your money. The software is fraudulent and designed to execute losing trades, the brokers are liars and thieves, and the whole trading experience is negative. In a nutshell, please avoid the Bitcoin News Trader SCAM software and spend your money wisely. We were able to find a reputable software that actually works. We tried it ourselves and made consistent amounts of about £300-500 every day. If you wish to join and see what its about you can check out our detailed review below to get more details.